Agriturismo Il Cascino is situated 700 m past Montefioralle, uphill, when coming from Greve in Chianti and Route 222 (the Chiantigiana). From Florence and Siena, you can come via the Chiantigiana and turn off on the northern outskirts of Greve for Montefioralle. 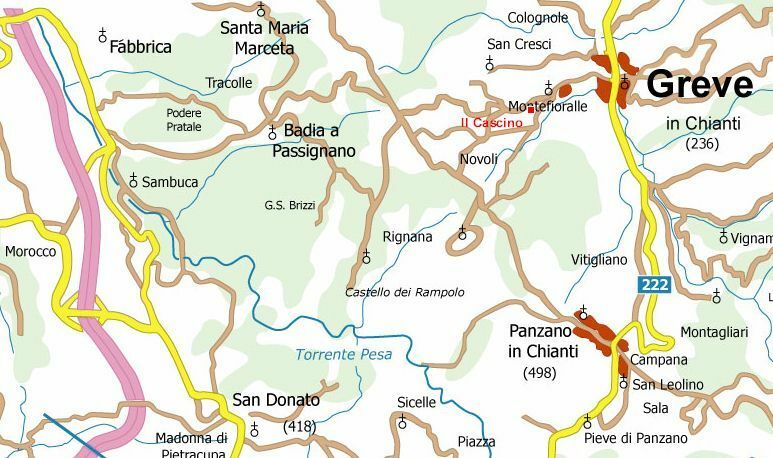 If you use the Florence- Sienna autostrada, exit at Tavarnelle or San Donato for Sambuca, Badia a Passignano and Montefioralle. 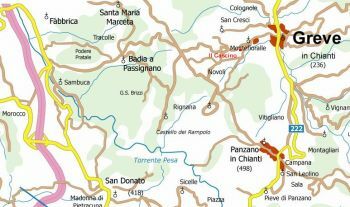 Click the map to the left to open a larger interactive map showing sights of interest near Il Cascino and throughout Tuscany. Il Cascino is marked on the road running westwards from Montefioralle towards Badia a Passignano.